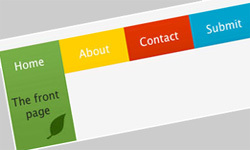 Navigation using jQuery and CSS is becoming more common and popular. As navigation is one of the most important aspects of any web design, most of us believe it making interactive and attractive. jQuery is excellent choice for attaining this. There are numerous things you can do with jQuery to enhance navigation menus, yet here are 15 of the best techniques and solutions for spicing up your website navigation. Thanks for sharing this great examples in jQuery nav’s and the inspiration in creating some other styles by webdesigning future client-websites.